Artwork sampled in May of 2017 from a private collection. Through the Leonardo da Vinci DNA Project, researchers at J. Craig Venter Institute (JCVI), led by Karen Nelson, PhD, began taking environmental samples from different pieces of aging artwork with the aim of understanding which microbial species are present on varying surfaces and how these communities affect preservation efforts. This area of research also has broader forensic archaeological implications. 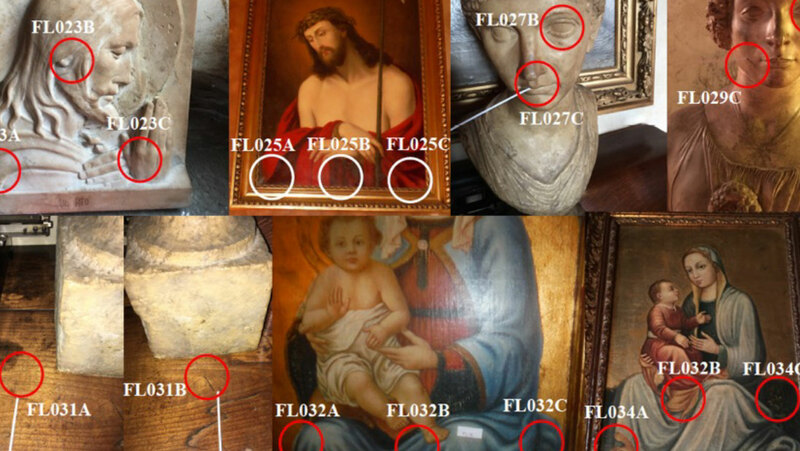 JCVI hopes to use these methods to study Renaissance period artwork in the near future. This past week the Leonardo DNA Project team met in Florence, Italy where they held public lectures on the overall progress of the project and to plan next steps. Findings from the microbial analysis component of the project, for which JCVI is responsible, were presented by Manolito Torralba. The speakers and participants of the Leonardo da Vinci DNA Project May 2018 Conference. One-hundred forty-two art surface samples were catalogued, the first of which was taken in December of 2015 and the second group in May of 2017. Each work sampled had on average three sites tested. The base materials for the works includes stone, wood, canvas, metal, and plaster—some of which were painted on. Using a statistical modeling process, principle coordinate analysis (PCoA), researchers have shown that samples from the same substrate, or base material, cluster and that there is some overlap between stone/marble and wood microbial communities. JCVI researchers report that oil degrading species are present on canvas areas in deteriorated states. Additionally, oxidase positive organisms, which may be responsible for further breakdown in the art, are in high abundance on painted surfaces. Additional samples from May 2017. In total, 96 swab samples were collected at this time (48 DNA and 48 RNA). Future aims of the microbial analysis component of the project include 1) expanding they types of art being sampled to include fresco, painting on animal hides, other stone types, and glass; 2) confirming the presence of oxidase positive elements through metagenomics and metatranscriptomics sequencing; 3) identifying fungal species using molecular markers; and 3) using genomics to identify authenticity and geographical origin of works of art. The Leonardo DNA Project’s broad aims are to conclusively determine if the remains purported to be those of Leonardo da Vinci at Amboise Castle are his, by comparing DNA profiles to those of known relatives. Additionally, it will look at genetic markers using whole genome sequencing from Leonardo’s remains to better understand his extraordinary talents and visual acuity through genetic associations. Also, using novel informatics approaches researchers will create three dimensional images of Da Vinci using the genome sequence data. Funding for this project provided by The Richard Lounsbery Foundation.